It’s time to exit Amazon KDP Select, and the rules changed without notice! For those who read this blog, you will know that I believe Amazon is the first choice platform and retailer for self-published authors, as it offers the best chance of gaining sales. On top of this, Amazon KDP Select can give new authors especially, a launching pad via free ebooks and now, Kindle Unlimited, but at the cost of granting Amazon exclusivity. With that said, though, I don’t believe that leaving ebooks exclusive with Amazon and Select forever is a good idea. One reason is that it stymies all chances of finding additional markets and readers, as not all of the reading world uses Kindle or Amazon. My other reason is only a hunch, but after numerous entries and exits with KDP Select exclusivity, I believe that the benefit reduces after two or three enrolment periods. I am not sure why, but I could well imagine that Amazon’s marketing algorithms give more favour to newer titles, as well as newly enrolled exclusive titles. Time to exit Amazon KDP Select, and bang, the rules changed! As I said, I have exited KDP Select many times, and usually, without any problems. Once or twice I got my dates wrong, though, and had a title up on Apple and B&N a few days before the expiry date. This resulted in me getting a very nasty email from Amazon. However, in the last couple of years, I have set-up my existing titles on Smashwords on pre-order a week or so before my exclusivity expires, which has worked without a problem. You can read my previous post here, Use Smashwords Ebook Pre-orders While Enrolled In KDP Select. When I exited the last time, I received one of the dreaded threatening emails from Amazon KDP Select. We have found that book(s) you’ve published don’t meet the KDP Select content guidelines. Books enrolled in KDP Select must be exclusive to Amazon in digital format during the entirety of their enrollment in the program. Our records indicate that we previously informed you that submitting non-exclusive content to KDP Select and may result in loss of KDP Select benefits, including participation in Kindle Unlimited, the Kindle Owners’ Lending Library (KOLL) and the usage of Kindle Countdown Deals or free promotion days. The next violation will result in your entire catalog being un-enrolled from KDPS and suspended from re-enrollment into the program. I was perplexed, and, of course, sent off a reply asking what the problem was. The reply I received was the normal ‘cut and paste‘ of KDP FAQs, which again, as usual, didn’t address my question at all. I tried again but got no reply. Ah, the oxymoron of KDP Help! I would hate to be drowning. So, I started to do some digging and came across a change to the Amazon KDP Select terms that caused my problem. I have no idea when these terms were changed, as Amazon does not date alterations, and never issues advice of changes, but as a user, you are bound by them. Fair? Well, it doesn’t matter. Amazon makes the rules and can change them at any time, and does so. When you enroll a book in KDP Select, you’re committing to making the digital format of that book available exclusively through KDP while it’s enrolled in the program. All content enrolled in KDP Select must remain for sale through the Kindle Store only. If the digital version of your book appears to be available for sale or for free elsewhere (such as on your website or blog, or a third party’s website), then it is not eligible for KDP Select. Adding new content (such as bonus content, author’s commentary section, etc.) to a book that is available elsewhere will not satisfy the exclusivity requirements. However, you may choose to make up to 10% of your book available on other sites as a sample, as well as continue to distribute your book in physical format (including print on demand books), or in any format other than digital. When you choose KDP Select for a book, you’re committing to make the digital format of that book available exclusively through KDP during the entirety of its enrollment in the program. All content made exclusive to Amazon in KDP Select must remain for sale on our site only; it cannot be available for free or for purchase in digital format anywhere else, including publishing the content of your book on the web, including on your own website, blog, etc. There is one very big change between the two versions. Now: If the digital version of your book appears to be available for sale or for free elsewhere (such as on your website or blog, or a third party’s website), then it is not eligible for KDP Select. So, now I know why Amazon sent me the dreaded email. Because it changed the rules. Before, an ebook on pre-order on another retailer was not available for purchase, which was fine, because it was within the KDP Select exclusivity rules. But now, a pre-order appears to be available, which is not fine. This is not the first time Amazon has changed the rules for KDP self-publishers, and it won’t be the last. So never think that you know the rules, as they are always subject to change, without notice. If you plan to use a mix of exclusive and open publishing for your ebooks with Amazon and Draft2Digital or Smashwords, take care when moving your titles in and out. When planning to enter into KDP Select, allow plenty of time for your titles to be delisted from your aggregator’s retailers. Also, check your KDP Select enrollment, and remember to de-select the tick box for an automatic extension if you wish to end your exclusivity after 90 days. And lastly, perhaps check the terms and conditions, just to be sure. ← What Paypal Fees Can Authors And Pro Bloggers Expect To Pay? 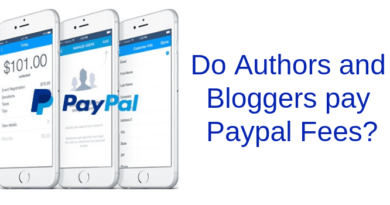 What Paypal Fees Can Authors And Pro Bloggers Expect To Pay? Some Readers Prefer Ebooks – Why Keep Arguing? Does Kickstarter Crowdfunding Work For Self-Published Authors? I’m not sure the web archive is accurate, Nate. My original post on this topic was in October, and the terms I posted then were taken directly from KDP Select terms, so they were accurate. However, that is not the point of this advice post. It is that Amazon regularly change its KDP terms, without notice. This is a fact that all self-publishing authors should be made aware of. Curious … I wonder if offering a free copy to a blogger in exchange for an honest review would violate the KDP Select terms. It is ‘free’ in the sense that no money changed hands but there is the labor-cost of writing the review. It would seem ironic that Amazon would forbid this practice, as a good review has the potential for boosting sales and thus increasing Amazon’s share of the take. Amazon sends very nasty and abrasive emails. Not because they are giant means that they should squash everyone else. Its disheartening. Very Good Explanation. I’m sorry you were treated soroughly but these days that seems to be happening a lot. Don’t take it personal as hard as that may seem! I agree that Amazon is trash in terms of how they treat their customers/authors. 2.1 Changes to Agreement Terms Other than Those in Sections 5.4.1 (Royalties) and 5.5 (Grant of Rights). Changes to terms of this Agreement other than those contained in Section 5.4.1 (Royalties) and 5.5 (Grant of Rights) will be EFFECTIVE IN THE DAY WE POST THEM, unless we otherwise provide at the time we post the changes. YOU ARE RESPONSIBLE for checking for updates and your continued use of the Program after we post changes will constitute your acceptance of the changes. If you do not agree to the changes, you must withdraw your Digital Books from further distribution through the Program and terminate your use of the Program. Copied this to a FB writing group, hope you don’t mind. Amazon could easily do it, of course. That it doesn’t is a sure sign that it prefers users not to know about the changes it makes. However, GDPR might make Amazon change its ways, eventually. After a busy weekend of converting from Create Space to KDP, not Kindle Select, trsnsferring all four of my books, Amazon sent me a letter today terminating my account, citing misuse of metadata for my novel Virgin Soul.I wrote this novel which was published in a hardbound first edition by Viking in 2013. I published the hardback through ny indie press, EQUIDISTANCE, in 2016. The harsh letter said I would get none of the royalties due me prior to termination. All four EQUIDISTANCE titles have disappeared from Amazon. I am so sorry to hear your news. I must admit that I have never heard about the misuse of metadata, except in the case of KU ebook scammers. I hope you can contact Amazon and ask for more details. After several letters of inquiry, protest and explanation, Amazon relisted three of my press’ titles and apologized. The problem seems to have been with my novel in hb from Viking. I published it as a paperback with a slightly different title…that was fine. Trying to independently publish an e-book of my pb version of Viking’s hb was the sticking point. I concede that Viking has rights to the e-book of the original novel, not my press (Equidistance).